If Iran fully complies with the requirements of a recently signed nuclear deal, its ability to build a nuclear weapon will be delayed by just one month, according to a recent analysis published by a nuclear watchdog group. Before Iran signed a temporary agreement to halt portions of its nuclear program, experts pegged its breakout time—the length of time it would take Tehran to enrich the fuel needed for a nuclear bomb—at around one to one-and-a-half months, according to a recent analysis by the group United Against Nuclear Iran (UANI). If Iran goes along with the nuclear accord and ramps down some of its nuclear work, its breakout time will be pushed back from one month to just over two, according to UANI’s analysis, which cites figures from the Institute for Science and International Security (ISIS). "In reality, the accord does little to push back Iran's breakout time," UANI said in its report. 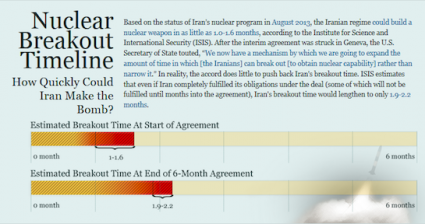 "ISIS estimates that even if Iran completely fulfilled its obligations under the deal (some of which will not be fulfilled until months into the agreement), Iran's breakout time would lengthen to only 1.9-2.2 months." The short setback will be accompanied by a rise in Iran’s stockpiles of enriched uranium, the key component in a nuclear weapon. Iran’s stockpile of 5 percent enriched uranium, the production of which is permitted under the terms of the deal, will rise by 400 kg during the next six months, when the nuclear deal is in full effect. Though Tehran is required to eradicate its stores of 20 percent enriched uranium, it will do so by converting this material back down to the 5 percent level, according to Iranian nuclear officials. The "400 kg of 5 percent enriched UF6 will be gained by changing 100 kg of 20 percent enriched uranium to below 5 percent," an Iranian nuclear official said Wednesday according to the Iranian Students’ News Agency (ISNA). 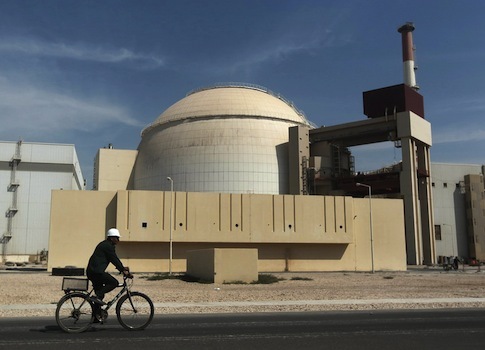 The West is permitting Iran to keep this nuclear fuel under the deal, according to ISNA. "It was one of the main areas of disagreements between the two sides," the nuclear official said. "The other side insisted on oxidation of the 5 percent uranium, but we did not accept it." Iran’s nuclear progress will not end there, according to UANI, which is tracking every facet of the deal on its newly launched Geneva Interim Agreement Tracker website. Iran will continue work on the Arak heavy water nuclear reactor, which could provide the country with an alternate path to a nuclear weapon. Tehran also can continue to perform advanced research and development on centrifuges and other nuclear technologies under the deal. Additionally, it will not be barred from performing tests on long-range ballistic missiles, a weapon that could carry a nuclear payload over great distances. In addition to boosting Iran’s nuclear stockpiles, the nuclear deal is helping to rescue Iran’s ailing economy. The deal will grant Iran more than $4 billion in sanctions relief via regular cash infusions. It also will enable companies and governments from across the world to reengage with the Iranian economy, providing it an additional financial boost. Iran could reap well over the $7 billion estimated by the Obama administration as a result of oil sales and investments by outside companies, a trend that will "only accelerate in the next six months," according to UANI research director Matan Shamir. UANI’s new site will track the effects of sanctions relief, as well as Iran’s compliance with the deal and the ongoing development of its nuclear program. Shamir went on to say that it is "a pretty severe exaggeration for the administration to say that the relief is ‘reversible.’ Iran is, after all, gaining access to frozen money and expanding its revenue through sectors that are no longer under sanctions, and it can spend that money on whatever it chooses." The World Bank "projects that Iran’s real 2014 GDP is expected to grow by 1.0 percent after a recession in 2012 and 2013," Mark Dubowitz, executive director of the Foundation for Defense of Democracies (FDD) noted in a recent report. "The Iranian economy is further projected to grow by 1.8 percent in 2015 and another 2.0 percent in 2016," according to the World Bank’s figures. Companies from a variety of top industries are hungry to reenter Iran. "A variety of companies have called us to ask our views about reentering Iran, particularly in the oil and auto sectors," said UANI spokesman Nathan Carleton. "If the Obama administration and EU are serious about not letting the floodgates open, they need to send a clearer message saying that Iran is not back open for business."